Vivacious Zenobia Baumgarten and her husband Herman (right) accept the prize for winning the Total Eco Pioneer Challenge. A cheerful environment is more stimulating for young minds. Baumgarten’s church courses have been well attended. 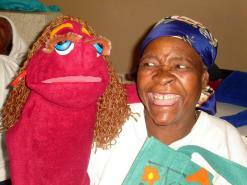 The colourful hand puppets are also used to educate children about issues such as HIV and tuberculosis, on a level to which they can relate. • How does Mandela Day inspire you? Zenobia Baumgarten is not only a woman with a zest for life, but she loves to share that zest with others. 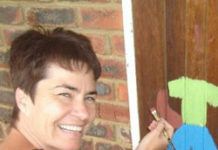 Baumgarten is the 2012 winner of Total South Africa’s Eco Pioneer competition – and a handy R20 000 (US$2 400) – for her use of natural and recycled materials to decorate her home. In her spare time she plays her part in the community by decoratively painting childcare facilities, no matter how humble they may be, and helping caregivers to more creatively keep their little charges occupied and educated. The Total Eco Pioneer initiative was launched at the end of October 2011 to coincide with the release of the company’s new ultra low sulphur 95 octane unleaded fuel. The campaign was run entirely through social media, and the six finalists were chosen from nominations gathered via Facebook and Twitter. Until voting closed on 31 January, fans were allowed to cast a vote a day for their favourite. Baumgarten fought off competition from a honey and beeswax initiative; a company that makes bricks for fuel from recycled paper; a bag-making venture; an eco-school; and a company that recycles waste into packaging. But in the end her quirky knack for transforming unlikely objects into interesting and useful pieces won the day. “Although we weren’t well off, I still wanted to be one better than the rich ladies,” said Baumgarten, wearing a brooch fashioned from a vintage cookie cutter, at the prizegiving ceremony in May. Baumgarten and her family live in Bothaville, a Free State farming town located near the Vaal River. By her own admission, there’s not much around, no big shopping centres or busy retail districts, so she and her family have had to draw the most out of the resources around them. To make ends meet while raising their children, Baumgarten and her husband Herman used natural and recycled materials as well as their own craftwork to build and decorate their home. Her innovation caught the attention of the popular Tuis magazine and its English counterpart Home, both of which offer hints, tips and advice for the house, kitchen and garden. In April 2011 the magazines featured Baumgarten’s home on their covers and in a feature inside. Not content with beautifying her immediate environment, Baumgarten became driven to do the same for others in her community. She decided to focus on schools, and with her creative streak was keen on using paint to brighten these sometimes cheerless institutions, including the exterior and interior, and even the blackboards. Baumgarten soon found herself venturing into the nearby townships, where children are often cared for during the day in shacks that can’t be distinguished in any way from the hundreds that surround them. She recalled one particular structure which was too small for all the children, and she told the lady in charge that she would gladly paint it if it was expanded. The next time she visited, the crèche was more than double its former size. “I’m sure that lady asked everyone around her to donate a piece of metal sheeting,” said Baumgarten,”but she managed to make it bigger.” The paint job was done, and the crèche given a new lease on life. Having a cheerful place in which to spend their day, said Baumgarten, gives the children pride and makes them feel like they belong, especially when they’ve had a hand in improving their surroundings. Inspired by the success of the décor project and wanting to do more, she began showing caregivers how to make enchanting hand puppets to entertain the children with songs and stories. 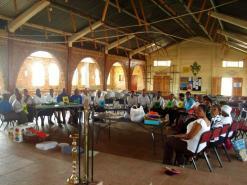 She then held a few courses at local churches where caregivers could learn more educational techniques, and was thrilled to see men attending the second course. 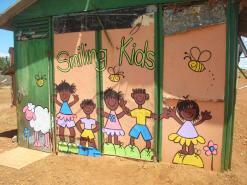 To date, she estimates she’s painted around 50 nursery and primary schools in the area – which is just about all of them. She carries all the costs herself, and asks only for help with the paintwork from the teachers, mothers or children. As if that wasn’t enough, Baumgarten has also secured a t-shirt sponsor which enables her to have t-shirts printed for each nursery school, to give the children more of a sense of unity. Baumgarten jokes that where other men might buy flowers for their wives, especially after a tiff, Herman will buy her paint.